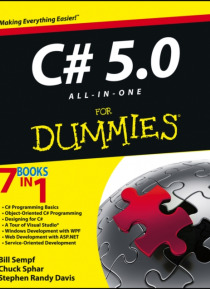 800+ pages of top-notch coverage; perfect for learning the fundamentals of C#! C# is a complex programming language for building .NET-connected software for Microsoft Windows, cloud computing, the Web, and a wide range of devices. Today's developers use it to develop Azure and Windows Phone apps, and Android applications using Mono. Novice programmers can get up and running quickly on C# using th… is practical guide. Crammed with 800+ pages of information, this all-in-one book helps you quickly create a C# program while learning C# and object-oriented programming fundamentals, Windows and Windows phone programming, and more. Helps novice programmers learn C# programming and create their first C# program Explains how to create Windows applications with C# and Visual Studio Delves into Windows Phone programming, as well as object-oriented programming basics Covers debugging, errors, comparisons with C++ and Java, classes and arrays, variables, and more Includes access to a companion website with sample code and bonus materials Everything you need to make the move to C# programming is right here, in C# 5.0 All-in-One For Dummies.